Gordon's days are numbered, but not before he makes sure it's the same for others. There is no end to this man's despicable ways. 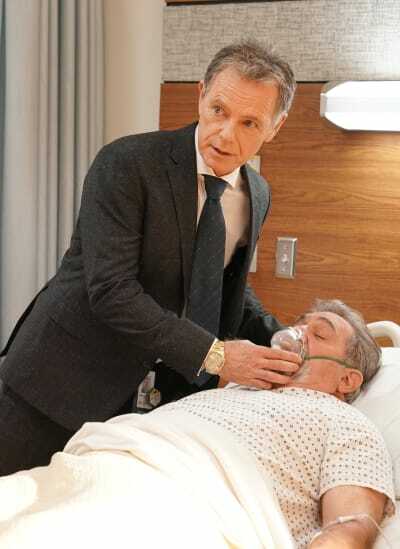 The moment it seems like he may be down and out, as evident by the end of The Resident Season 2 Episode 16, he finds a stroke of luck. The stroke of luck in this instance is also the man who helped bring him down a peg; Marshall. 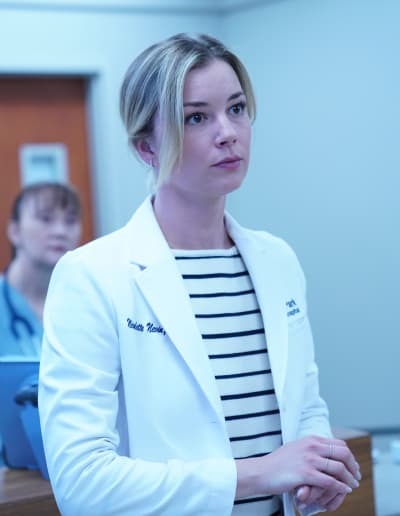 Only on The Resident can you be so pleased to see someone, and so hyped up and excited that they did what others could not, and then so disappointed all within the same hour. Marshall is in good health, and he's ever the perspicacious shark that we have come to accept. It's a delight when he's on your side. He was right there alongside Bell when pleading their case to the board about severing their partnership with QuoVadis. When he appeared at QuoVadis, the excitement rose at the mere sight of the back of his head as he walked through the room. Marshall is the big guns, and he's someone whom the others had reason to bring into the fold to go toe-to-toe with Gordon in a way that only he can. You saved more lives than I did today. Permalink: You saved more lives than I did today. If Gordon was going to be taken down or destroyed, Marshall was the sort to do it. The season's dynamic duo of Mina and Devon (Mevon?) and yes, I still miss Hawkfor with my entire being, made a gallant effort. They work well together, and they were smart to appeal to Benedict, although they probably shouldn't have done it at QuoVadis within Gordon's sight. Benedict holds many of the cards, and he has a great deal of information that could be valuable. He's affected enough by disappointing and betraying AJ to bend to their will a bit, but again, not in front of Gordon's watchful eye. It's a shame that we never heard what he planned on telling AJ because of his request to only speak to AJ. 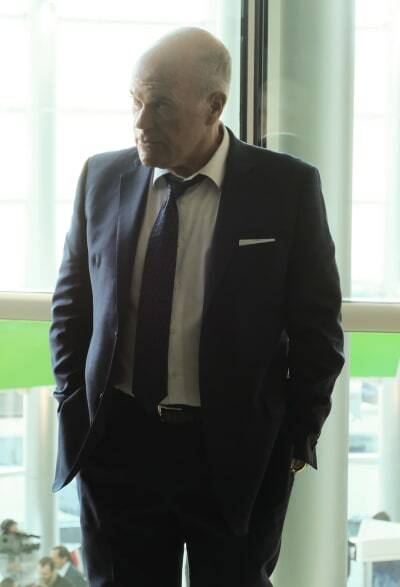 After his meetup with Gordon that was eerily similar to Julian's last meeting with Gordon, it's apparent Gordon will send someone to handle Benedict. It's rather foolish and reckless of Gordon since the walls are closing in on him. He's too arrogant and too convinced he has all the power to not exact revenge. Zoey was small beans, and the Dream Team's plan to have her speak to the press was never going to cut it. As expected, all Gordon had to do was wave some money in front of her. 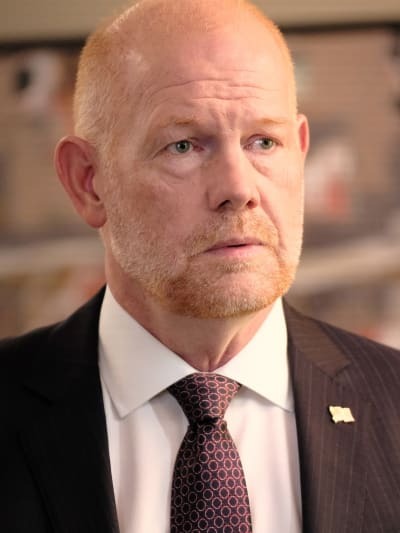 Gordon: I'm here to tell you that QuoVadis is willing to pay for Henry's medical bills, not a for a month, not for a year, but for his whole life. Zoey: I don't believe you. Gordon: I'll put it in writing. Permalink: I'll put it in writing. It's easy to be annoyed with Zoey for backing out of the plan, but in the end, she's a single mother with a child who needs more medical care than she can afford to provide. The combination of Gordon's veiled threat and his money was enough to have her backing off. Unfortunately, she couldn't think about the many lives that would be in danger at the hands of QuoVadis and their faulty medical devices. She could only think about the life of who matters to her most, her son. Henry is all she has now. Conrad's disappointment mirrored my own, but we knew she wouldn't be the one to take down Gordon either. No, it required the touch of someone who understood how to play the game; that person was Marshall. In a twist that we maybe should have seen coming, but some of us probably didn't expect, Marshall planted the proper seed to destroy QuoVadis' reputation, and then he swooped in with an offer to acquire the company. It is what he is known best for if you don't recall. He made that phone call moments after a happy and proud Conrad complimented Marshall on saving more lives. So, what does this mean? Marshall knows a business opportunity when he sees one; this doesn't necessarily have to be negative. Gordon Page is putting the VNS in 20 soldiers today to cure PTSD. Permalink: Gordon Page is putting the VNS in 20 soldiers today to cure PTSD. Despite the ending, I'm concerned for Marshall. Gordon is ruthless and impulsive, and he's not above making a move against Marshall. I don't want to think about how unbearable it will be if something happens to Conrad's father. Gordon doesn't rest for very long, but if he goes after Benedict and Marshall, shouldn't someone's radar go up? Too many people are disappearing or having issues around him. It's still odd that nothing fruitful has turned up in the investigation into Julian's disappearance. No one has found her body, the police haven't interviewed Devon, and it's as though she never existed. Gordon is due to spiral out, and it's hard to say how many people will be affected. He's going to want to go after Benedict, and Marshall, but what about Bell, Devon, maybe AJ and Mina too? Bell had enough on his plate during this installment. It was a nice hour for Randolph Bell. All season, many of us have noted that he's grown and evolved as a character. 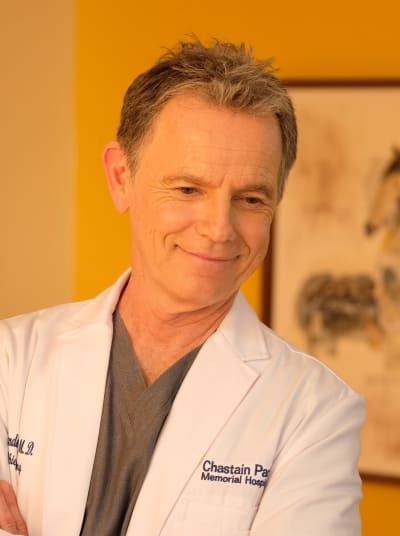 He was never a one-dimensional character, but he has been the dark horse of the season -- his evolution remains intriguing, and Bruce Greenwood's performance remains a highlight of the season. Bell's attachment to Simon, played by the incomparable Dan Lauria, humanized Bell in a way that we haven't seen before. He was already showing his compassionate side when he was making his case to the board and recounting Henry's experience. You could tell how much it affected him witnessing this young child's heart stop time and again. It's something about being there in that moment and holding a child's life in your hands. I imagine he couldn't shake that no matter how hard he tried. However, his relationship with Simon brought out a softer, kinder, and gentler side to Bell. The two men had a nice rapport, and it makes one curious about Bell's familial background. You know, I love my job. The pay's not great, but every day I get to help you save lives, and I sleep like a baby. 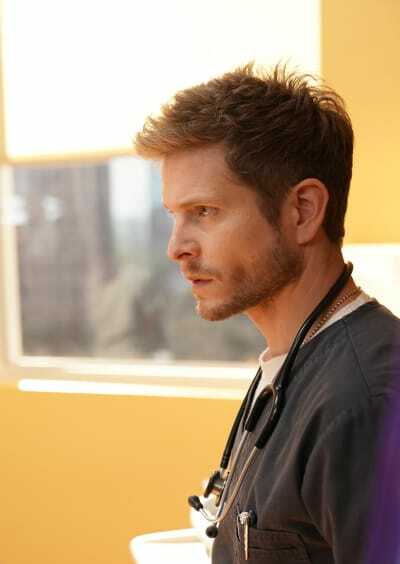 Simon had a paternal vibe, and he knew Bell from the days when Bell was a resident at the hospital. What a nice tidbit of information to learn about Bell. It puts into perspective Bell's love of Chastain. He did his residency at Chastain, and he's been part of the hospital since then. He has gone from a resident to the chief of surgery, to the CEO. For Bell, Chastain is his home. It was also some nice confirmation that once upon a time, Bell was a lot like Conrad. It's not the least bit surprising. In some way, I think we all suspected that there was something deeper to the friction between Bell and Conrad. Bell sees a lot of himself in Conrad. Conrad was surprised to hear this, but as Simon reminded him, the hospital has a way of changing people. Simon's death was tragic because of how sweet he was and how much he meant to Bell. Simon's myoma and his heart were too much for him to survive. Bell cleaning up the OR with such tender care in honor of his friend was such an emotional and touching scene. When Randolph was young, he was a lot like you. Permalink: When Randolph was young, he was a lot like you. Meanwhile, Marilyn's case at the clinic was another one of those cases that make you angry about the healthcare system. It's a damn shame she had to endanger her life in order to receive emergency surgery. The absurdity of medical loopholes is laughable. The clinic is a success, and it's always busy, but I'm wondering how long Alec will stay on. He does seem to miss his mobile clinic. He felt like he reached more people that way, and the stationary aspect isn't his thing. Is Nic the only reason he's staying? Nic isn't a strong enough reason to stay, especially when he knows she's in a relationship with Conrad, and she ran away from him when she realized what he was hinting at. I like Alec well enough, but I don't know what he's angling for here, nor do I understand why he's making moves on her. Is it too much to expect that he remain professional? For the most part, there is nothing about them other than fandom speculation and fear that supports them being anything more than platonic workmates. Alec: You know what I stayed, don't you? You're here. Nic: We make a great team. Alec: Yes, we do make a great team. I feel like there is something more. Permalink: Yes, we do make a great team. I feel like there is something more. He backed off when he realized she and Conrad were together, so why bother flirting with her now? Their final scene together was just odd. I don't know. I know you CoNic 'shippers aren't pleased by this development though. I expect to hear about it below in the comments. Also, what did you think about this softer, sweeter Bell? Were you surprised by Marshall's actions? Anyone else wondering how he got those warehouse pictures? Will Benedict survive Gordon's wrath? Let's discuss below! 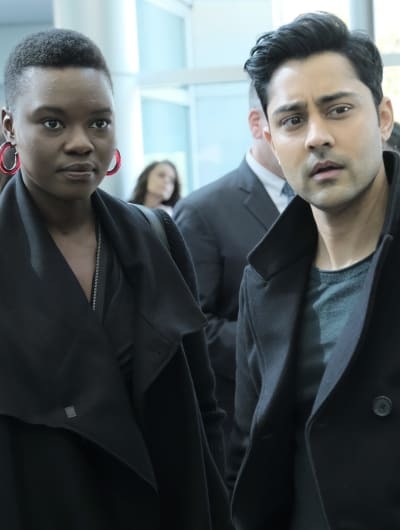 The Resident returns in two weeks with an all-new episode. 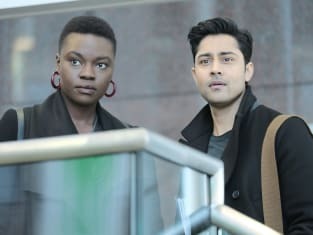 You can watch The Resident online here via TV Fanatic. Well, I guess being friends with you finally did me some good. Permalink: Well, I guess being friends with you finally did me some good.